Handbook of the Psychology of Aging, 6e provides a comprehensive summary and evaluation of recent research on the psychological aspects of aging. The 22 chapters are organized into four divisions: Concepts, Theories, and Methods in the Psychology of Aging; Biological and Social Influences on Aging; Behavioral Processes and Aging; and Complex Behavioral Concepts and Processes in Aging. The 6th edition of the Handbook is considerably changed from the previous edition. Half of the chapters are on new topics and the remaining half are on returning subjects that are entirely new presentations by different authors of new material. Some of the exciting new topics include Contributions of Cognitive Neuroscience to Understanding Behavior and Aging, Everyday Problem Solving and Decision Making, Autobiographical Memory, and Religion and Health Late in Life. The Handbook will be of use to researchers and professional practitioners working with the aged. It is also suitable for use as a textbook for graduate and advanced undergraduate courses on the psychology of aging. 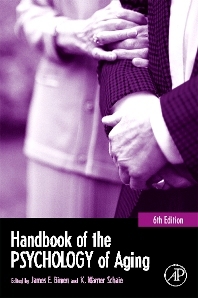 The Handbook of the Psycology of Aging, Sixth Edition is part of the Handbooks on Aging series, including Handbook of the Biology of Aging and Handbook of Aging and the Social Sciences, also in their 6th editions.